(CLEVELAND, OH) The Maltz Museum of Jewish Heritage is proud to announce the October 10th opening of a new special exhibition. Beyond Chicken Soup: Jews & Medicine in America tells the story of how Jews were forced to create access to their own healthcare in the face of discrimination. This timely exhibit is an education on the historic fight for equality in healthcare and a look to the future of medicine in America. “Today Jewish physicians are ubiquitous in America. It was not always so. The story of this evolution and the contributions of Jewish doctors to modern medicine are the focus of this exhibit,” said the exhibition’s Chair of the Advisory Committee, Dr. Jeffrey L. Ponsky of the Cleveland Clinic Lerner College of Medicine and Case Western Reserve University. In the early 20th century, with anti-Semitism on the rise, Jews were being shunned from medical schools and denied medical care. 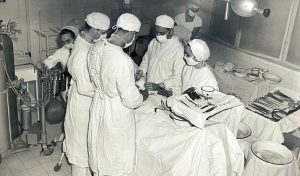 In response, Jewish hospitals were built to train Jewish doctors and treat not only Jewish patients but also other underserved populations. This important exhibition features over 200 artifacts, photographs, and documents, including highlights from Cleveland’s own Mt. Sinai Hospital, and illustrates how Jews used medicine to assimilate into American society, making significant contributions to the medical world and advancing civil rights. Beyond Chicken Soup: Jews & Medicine in America was created by the Jewish Museum of Maryland with support from National Endowment from the Humanities and the Institute of Museum and Library Services. The Maltz Museum of Jewish Heritage has added local content of specific interest to Cleveland audiences.